All girls are required to wear the correct school uniform. The following is a list of uniform requirements for pupils attending this school. All items are presently available in McFaddens, Drogheda St., Balbriggan. Junior students: Bottle Green with school crest embroidered. Senior students: Navy with school crest embroidered (Students should purchase navy if getting new jumper post third year). 2 Cream Blouses. In winter, white T-shirt only under blouse. Canvas/Runner type shoes are not permitted. 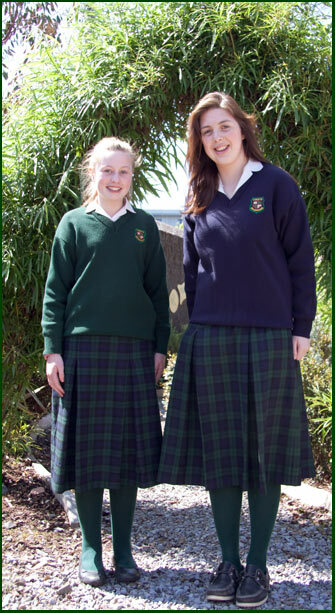 We expect our pupils to wear correct uniform at all times. We also expect parents to ensure that this requirement is met.